Notes: No.1 of a limited edition of 50 covers postmarked at Diss, near to where Diana was a pupil at Riddlesworth Hall Preparatory School. Very rare postmark in immaculate condition and unaddressed. The above Royal Mail Royal Wedding 1981 stamps were issued on 22 July 1981 by Royal Mail and feature the following stamp designs: 14p; 25p Portrait of Charles & Diana. 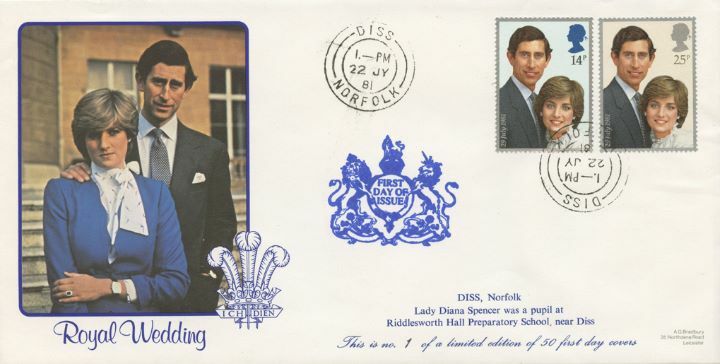 The Lady Diana's Prep School first day cover with the Diss CDS Postmark postmark has been produced by Bradbury and features these stamps which can make a very collectible and lovely gift.